(CNN) -- T-shirts and other official merchandise from what were billed as Michael Jackson's last concerts are up for sale, the shows' promoter told fans by e-mail Thursday. 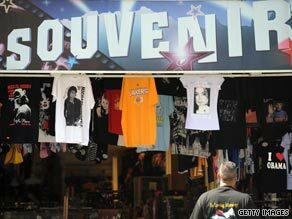 Official merchandise from Michael Jackson's "This Is It" tour is for sale, according to the shows' promoter. The e-mail, which went to people with tickets to London tour dates that were to start in July, reaffirmed an earlier announcement that ticketholders will receive a full refund or, if they chose, a commemorative ticket for the tour. The concert merchandise includes Jackson belt buckles, socks, hats, wallets, music and a myriad of T-shirts. "Early in June, Michael Jackson approved a line of official merchandise for you, his fans," said the e-mail from concert promoter AEG Live. "As we mourn the loss of one of the greatest talents the world has ever seen, we are only beginning to feel the impact that Michael left upon us all. A variety of official merchandise commemorates this incredible talent and preserves the legacy that is Michael Jackson." Fifty sold-out Jackson concerts were scheduled for the O2 Arena in London, starting July 13. The shows were billed as the final concerts of his career and were called "This Is It." Jackson was expected to earn $50 million from the London shows. The singer died with debts estimated at $500 million, and his estate will take years to unravel legally. On Wednesday, Paul McCartney refuted media accounts about the fate of the Beatles song catalog, which Jackson co-owned. "Some time ago, the media came up with the idea that Michael Jackson was going to leave his share in the Beatles songs to me in his will, which was completely made up and something I didn't believe for a second," a statement on McCartney's Web site said. "Now the report is that I am devastated to find that he didn't leave the songs to me. This is completely untrue. I had not thought for one minute that the original report was true and, therefore, the report that I'm devastated is also totally false, so don't believe everything you read folks!"